Who are they? Electro jazz supergroup featuring the undeniable talents of a certain Mr Carlock. Sounds like: Jazz jams with a dash of electro. And a whole heap of mind-blowing ability. Why should you check them out? Er...because they've got Keith Carlock behind the kit? The Sting/Steeley Dan/John Mayer/anyone who's anyone sticksman has really made his mark over the last few years, bagging top gig after top gig and now even forming his own supergroup. Rudder sees Carlock join forces with Chris Cheek, Henry Hey and Tim Lefebvre for an eclectic mix of jazz and electro, with a healthy dollop of experimental jamming thrown in for good measure. Intrigued? Check them out at Charlie Wright's on 12 November to see what all the fuss is about. 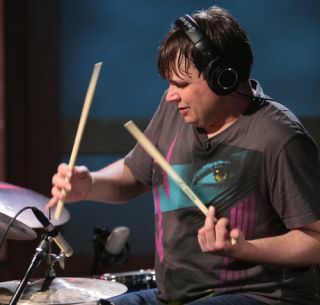 Got a question for Keith Carlock? Get your questions to us and we'll put them to him when we catch up with the drum legend this week! Email us at rhythm@futurenet.com.